Le Cordon Bleu Adelaide opened its doors to the next generation of culinary arts and hospitality professionals for an exciting 3-day Careers Residential. 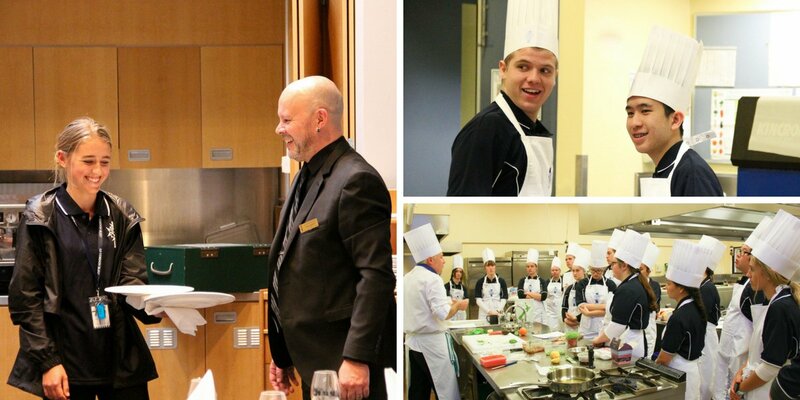 Seventeen senior high school students were taken on a whirlwind schedule of fun activities to explore their culinary curiosity, uncover the real world of hospitality, and discover potential study and career pathways. After a warm welcome from staff upon arrival, our guests met the Industry Engagement Team and heard about the amazing industry placement (Work Integrated Learning) opportunities available through Le Cordon Bleu networks. Alumnus Tim Attiwill (semi-finalist, My Kitchen Rules, 2017) who graduated with a Bachelor of Business (International Catering & Events Management) in 2006, visited with his successful food truck business CAROclub to chat about his career journey and feed hungry guests. To give students a taste of the Le Cordon Bleu classroom, Trevor Maskell (Wine Lecturer/Sommelier) brought a smile to everyone’s faces with his talk on Food & Beverage Service. Lecturer Ian Heath and Programme Manager Luke Montgomery presented their introductory lectures on Introduction to Marketing, and International Hotels & Events. A tour of the five-star Mayfair Hotel offered a glimpse of a real hospitality workplace, where Director of Operations Michael Collis explained what it takes to work in a hotel. At Korean restaurant Plus 82 Pocha, students enjoyed a meal together and heard from entrepreneur/alumnus Steven Lee (Bachelor of Business International Hotel Management) who co-owns the successful restaurant with four Le Cordon Bleu alumni. 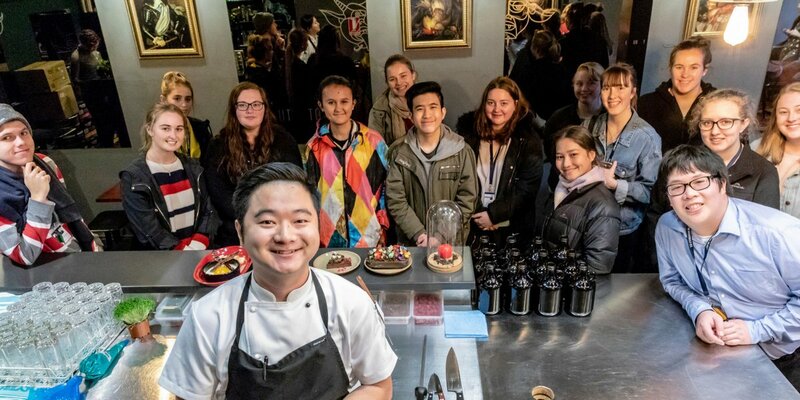 Two exciting workshops including a patisserie class with Chef Jenni Key making chocolate truffles, and a fun canape-making cuisine lesson with Chef Paul Gillies, gave students the opportunity to work in our state-of-the-art commercial kitchens. Shannon Hall (VET Academic Mgr) later talked about our world-class Patisserie & Cuisine programmes and explored potential study pathways. 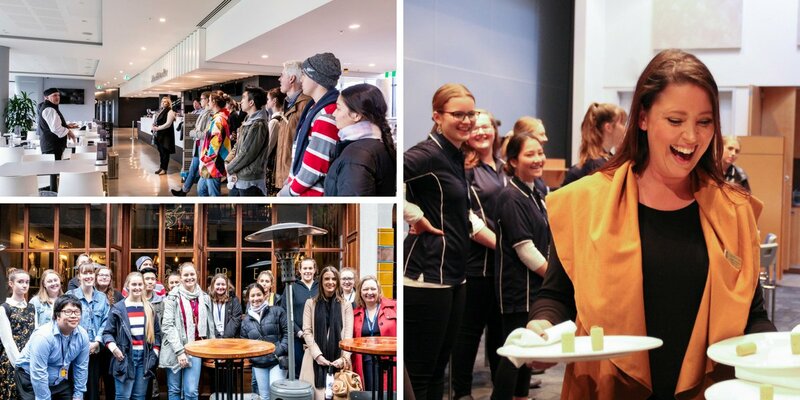 With a visit to Adelaide Oval and behind-the-scenes tour with Director of Cuisine Hamish Robertson, students discovered what it’s like to work for a large hospitality venue. 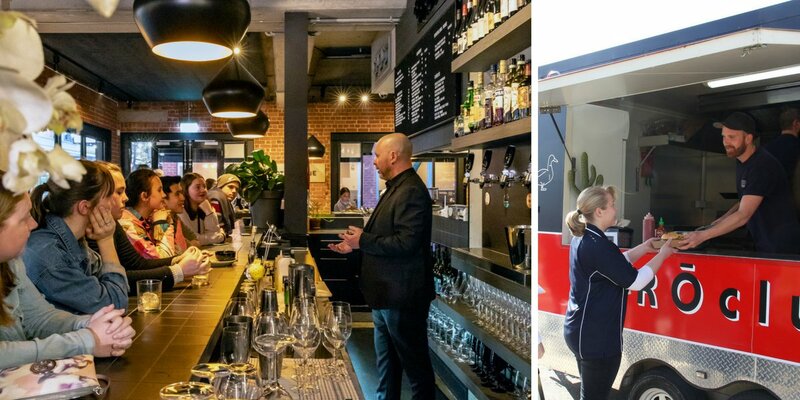 At popular wine bar Mother Vine, Sales Manager Patrick Madden shared industry insights from an employer’s perspective. A high note for all was dinner at Andre’s Cucina where guests enjoyed a spectacular meal with their new friends. The residential ended with an award ceremony where guests enjoyed drinks and canapes (made by students) with their parents and Le Cordon Bleu staff, while receiving their honorary parchments. Derrick Casey (Chief Executive Officer) delighted guests with the announcement that Le Cordon Bleu would be offering the group $30k scholarships towards the Bachelor of Business degrees and Advanced Diploma of Hospitality Management. Our 17 guests are invited to return as Le Cordon Bleu students after completing their high school studies, as Le Cordon Bleu is delighted to nurture the culinary and hospitality dreams of our next generation.